For my Stuck Foot Post I thought I'd stick my foot on hard sand in the shelter of a vertical though not enormously tall cliff. This part of the south coast of England sticks out into the sea and on this day (15th January 2015) the western side was being beaten by big waves while about a mile and a half away (where I was) they were lapping gently against the beach. None the less, the plants and I were wobbling around in the wind - those which poked up above the cliff's shelter were thrashing. 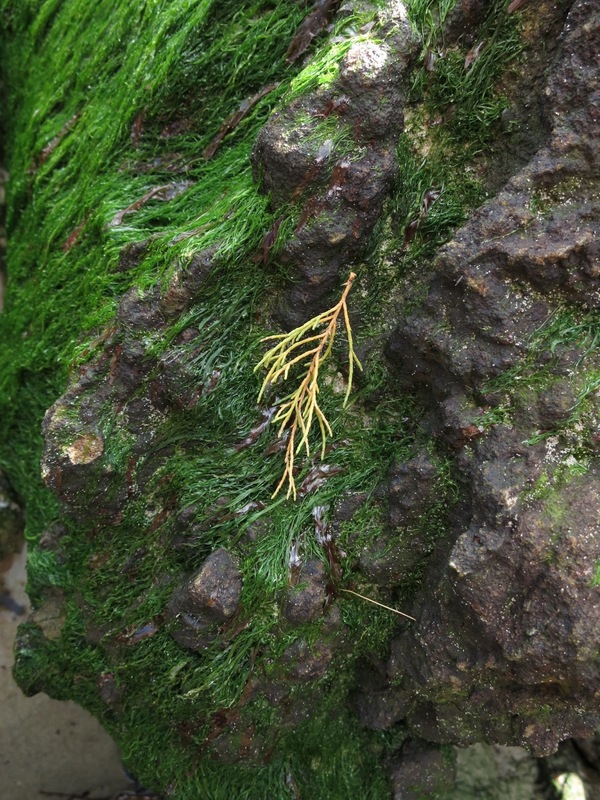 The tide was going out and little streams were pouring out of the rocks and earth across a narrow strip that is mostly covered in sea water at high tide. With it going out, I was safe. It would have been a stupid place to stand otherwise. I don't understand the sun. I would have expected it to be further round to the right. But, there it was, glaring in more from the south than I had anticipated. Or perhaps I'd turned more corners than I thought. A few years ago I bought a compass to help me decide where to go for what pictures but my belt, my mobile phone, all sorts of external metals interfered so it was a waste of time. I'd sit in a cafe and watch the needle spin round while I drank my coffee. The sun is more predictable. I may not know precisely where it will be but I generally have enough of an idea to know where to go and when. But I like silhouettes and this one was romantic. These composite rocks confuse me. There are places where broken concrete has been used to defend the cliffs from the sea. And rocks from other places have been brought in to do do the same - which confuses a confusion of geologies. 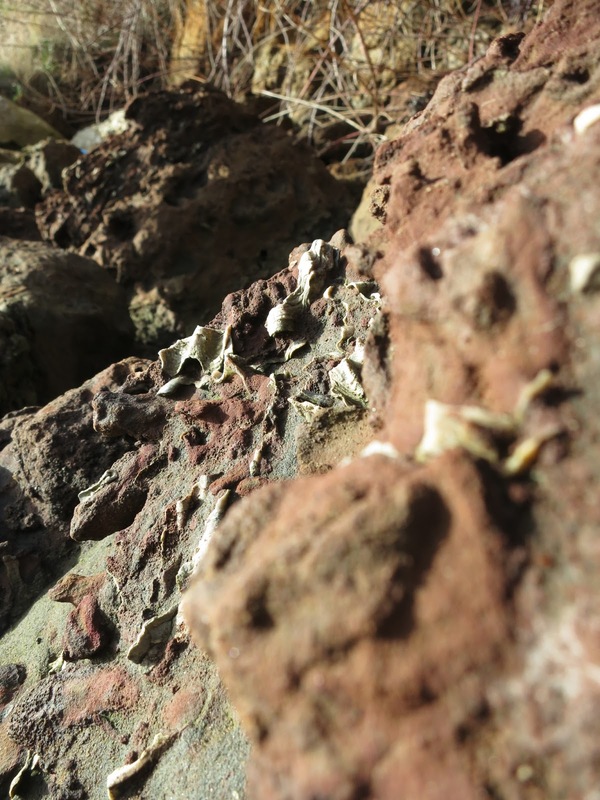 In this rock you can see loads of what I take to be oyster shells embedded in it. These could be new. (There are oyster beds near by.) They could be Roman. (Romans liked oysters.) They could be fossils. To me with my shining ignorance one looks just like another. On one of the rocks was a piece of blue material. Something very odd is going on round here. 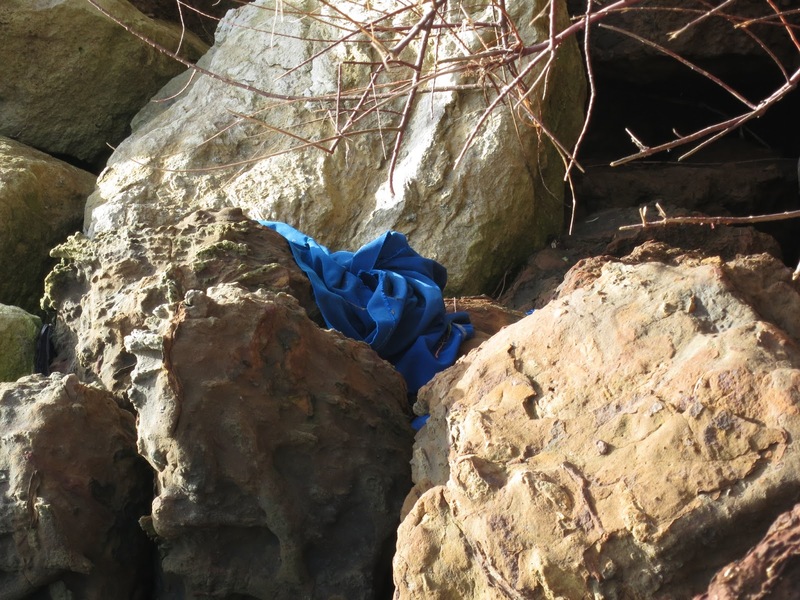 I've found blue material in bushes too. They are different patterns - plain or plaid - but always blue. Who is scattering scraps of blue material round the place? And why? Looking up from the rocks. Trees. I was expecting willow. This is not willow! So what is it? A bit had fallen on a rock. But higher up - would you not say these are willow leaves? They were moving in the wind so much it was hard to take their portraits. But then . . . it's the wrong time of year for willow leaves . . . isn't it? Well this cliff is a mixture of soft rock and earth so I wasn't going to climb up to see. It would probably have come down. Being squashed wouldn't be fun. Twist a bit further. What do we have here? 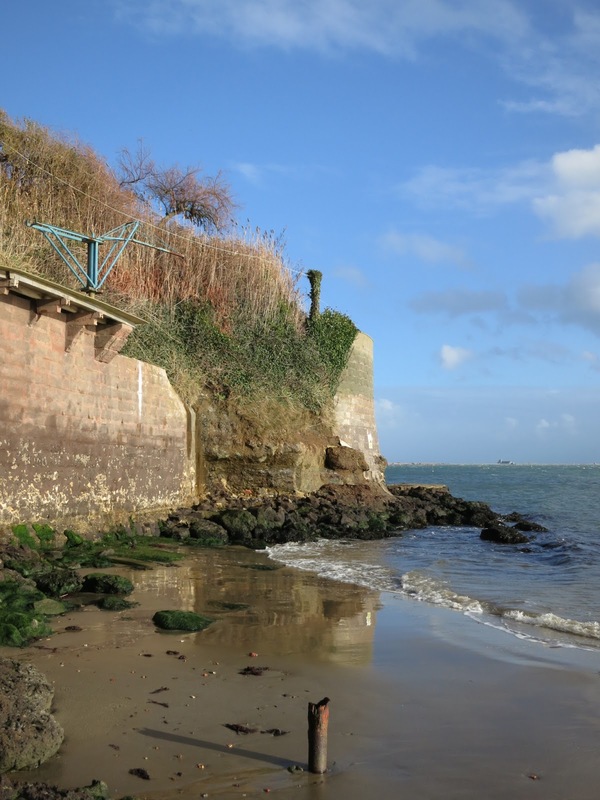 Sea defences in the form of walls built at the bottom of people's gardens. Ivy binding the steep earthy bit, reeds along the top then . . . a little hawthorn tree would you say? 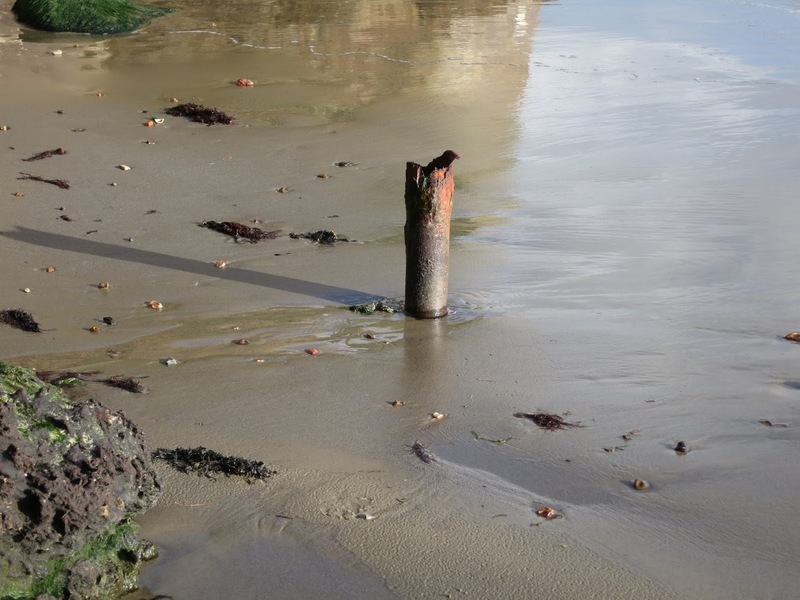 I don't know what the pipe is sticking up from the sand but I took its picture. Not only was it photogenic but it stood still. I reckoned the post deserved at least one photo in focus. Swinging back the other way to where I started - a video. Nothing much moves. The boat pier and the boats stay still. (They have been brought out of the water for the winter.) But you can hear the little waves. You can hear the wind. You can hear gulls. And the sound that sounds like birds twittering isn't birds but the boats' halyards rattling in the wind. They are like wind-chimes. A sea-side orchestra. As a separate issue . . .
and reviewing this book - see this post. There you are; a Stuck Foot post. I wobbled. I swivelled. But my feet didn't move. Not even a centimetre. You too could write a Stuck Foot Post. ? ? ? All photos in this post (and the video too) were taken on the afternoon of 15th January 2015. For more info. - there's a Page for Stuck Footers. Do join us! And last week I Stuck My Foot in a Garden - you might like to take a look at that post too. After all these months I hope I would recognise a Silver Birch, but I'm not sure about your possible Willow, Lucy. 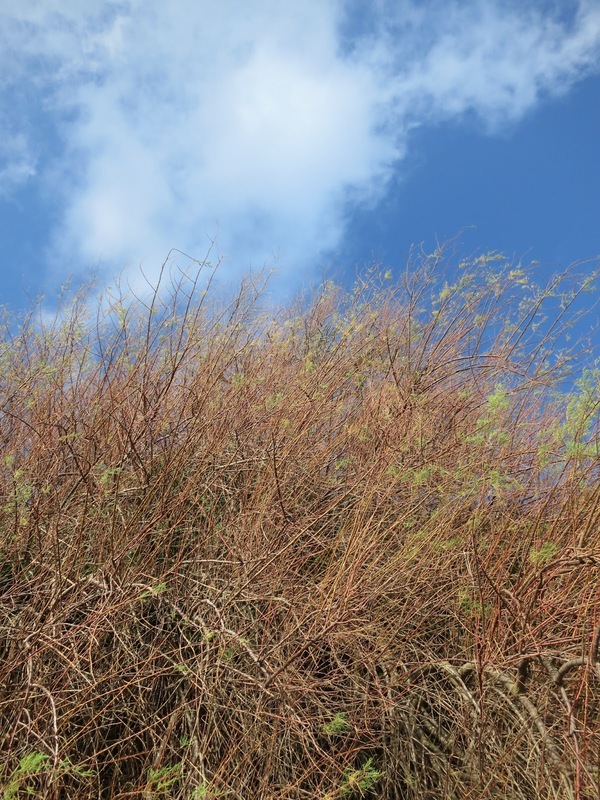 It couldn't be Tamarisk, could it, given the salty location? We used to see a good number in Cornwall ... but, as I say, I'm not expert. Hello Caroline. 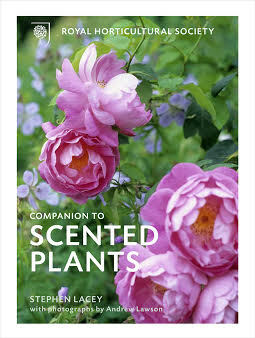 I looked up its foliage and you could well be right. The water comes right to its roots. It seems odd that I've never seen it in flower though. Perhaps it's just chance - I simply haven't been in that direction at the right moment. OH that was fun to see the cliffs, the rocks, the sea....I loved the rocks and how you noticed those trees and bits of the branches below...it is rewarding to stand in a spt and really be in the moment noticing all around us. I hope to do it more often. And I am glad you were able to stand upright and not fall over! My word, Lucy, your world is more exciting. Hope your world view rubs off a bit on me! 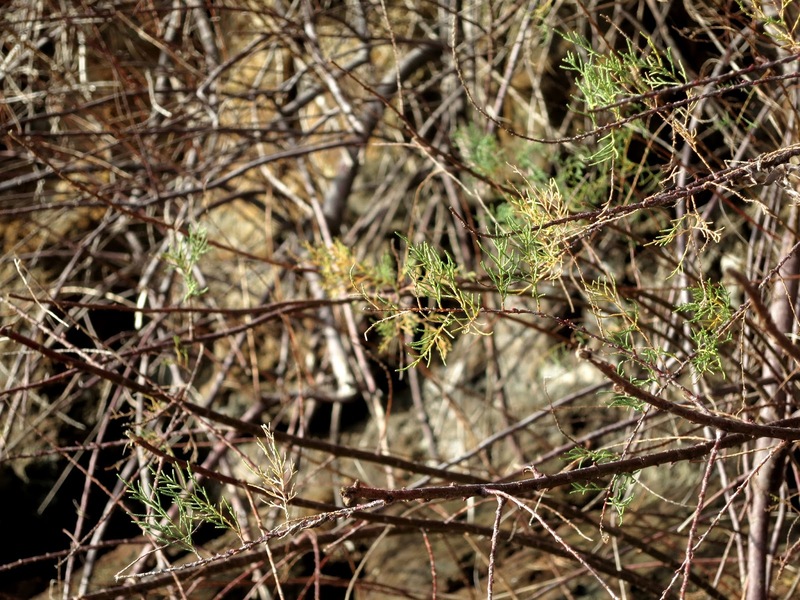 I'd say it could be tamarisk as well. Hello Donna. I like the sea. And I used to visit more often than I do now. But that remark about crumbling cliffs is not a light one. 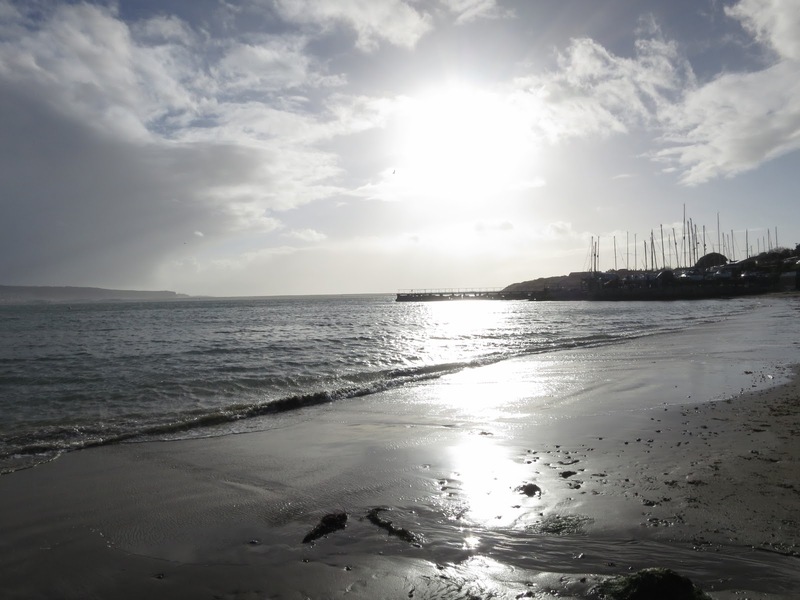 Landslips have made it harder to get to the beaches - one has to walk a long way round and the boring bit about getting there is a disincentive. But Cathy - you live in a mega place. I see your gardens - and do you live in the chateau too? That aside - I find the smaller something is the more there is to see about it. yet another vote for tamarisk. My mother liked it, but I find it a straggly plant, as it battles sea breezes. Perhaps the flowers redeem it?